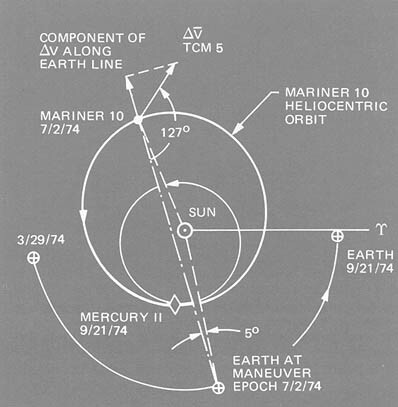 FOLLOWING THE FIRST encounter with Mercury, several more trajectory corrections were needed to direct the spacecraft into an orbit that would permit a return to Mercury on September 21, 1974. With suitable corrections Mariner 10 could again pass by Mercury, this time at 50,000 km (31,000 mi) above the daylight side. The TV optics design is such that the altitude provided substantial expansion of the photography of Mercury at 1 km (5/8 mi) resolution. Exactly the same face of Mercury would be illuminated by the Sun, but the daylight pass would allow photographs to be obtained that would tie together the two halves of Mercury seen at the first pass ( Fig. 8-1 ). Then scientists expected to be able to make a detailed and accurate map of almost one complete hemisphere of this innermost of the planets to a level of detail equal to that on maps of the Moon before the space age. Targeting for the second encounter was chosen such that a third encounter could also be achieved in order that the important question of the nature of Mercury's unexpected magnetic field ( i.e., whether it is intrinsic to the planet or induced by the solar wind) could be answered. Figure 8-2 shows the aim points for the three Mercury encounters. Fig. 8-1. The second encounter with Mercury allowed Mariner 10 to fly by the planet on the sunlit side, thereby filling in the missing areas between the two sections photographed at the first encounter. This second encounter took place on September 21, 1974. Additionally, in this encounter Mariner was able to obtain good views of the south polar region of Mercury. 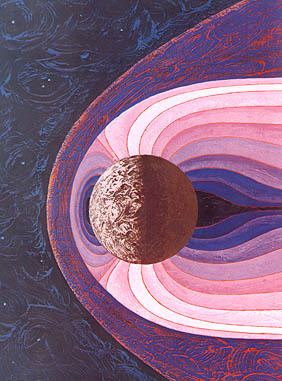 An artist's concept of the second flyby is shown in (a); (b) shows the added coverage obtained of the illuminated hemisphere. Fig. 8-2. The selection of aim point was important to permit a third encounter with Mercury six months later. The three aim points for the three encounters are shown in this diagram. ....attitude control gas, and analysis showed that gas usage would have to be reduced well below the normal cruise rate to last until Mercury III. Further, multiple trajectory correction maneuvers had to be conducted (five were finally required between the first and third encounters), meaning that a way had to be found to use the gyros without causing the oscillation problem. The only technique available to reduce gas usage, which involved using the solar panels and high-gain antenna as solar " sails, " was as yet little understood. Only limited experience had been gained so far during the mission with regard to this unplanned method. The prospects of achieving a third encounter therefore seemed dim, and Mercury II, although far more likely, was by no means assured. A fourth trajectory correction maneuver was commanded for mid-May 1974. Because only one TCM had been used between Venus and Mercury I, this fourth maneuver was large. To prevent overheating of the rocket engine, the maneuver was programmed in two stages. A burn on May 9 produced a velocity change of 50 m/sec (164 ft/  sec), and on May 10 the second firing produced a velocity change of 27.6 m/sec (91 ft/sec). This two-phase maneuver refined the aiming point of the spacecraft to 46,000 km (29,000 mi) above the sunlit hemisphere of Mercury. 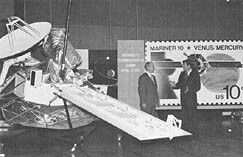 Mariner 10 reached solar conjunction on June 6, 1974, when it was on the opposite side of the Sun from the Earth (Fig. 8-3). During this period, communications with the spacecraft were interrupted. The dual-channel S- and X-band signals emitted by the spacecraft had to pass within 1.67 deg of the Sun's surface as viewed from Earth. Effects of the solar corona's electron clouds were recorded at the DSN Goldstone station. The primary effects were to cause the radio signal to scintillate, like a star twinkling in the night sky. A phase delay of the signal also occurred. Analysis of the difference in doppler effects on the S- and X-band signals yielded important information regarding the radial electron density distribution in the outer corona of the Sun. The influence of the Sun's corona on the range data received at X- and S-band became quite noticeable as conjunction approached. Soon the difference reached 3.6 microsec; a maximum of about 5 microsec was expected at closest approach. Effects of the Sun's enormous gravitational field were expected to reach as high as 160 microsec in an experiment to verify the effects of general relativity on the radio signals. Fig. 8-3. On its long journey around the Sun to the second encounter, Mariner passed on the far side of the Sun from Earth through superior conjunction. Contact with Earth was lost for a short while. A fifth trajectory correction maneuver had to be made soon after solar conjunction with the spacecraft at almost its most distant point from the Earth, as shown in this diagram. ....planet. A short while later the spacecraft commanded itself back to the cruise orientation and telemetered data were again received. Without the fifth correction, Mariner 10 would have passed about 34,000 km (21,000 mi) from Mercury's sunlit side, at a point about 45 deg south of the planet's equator. 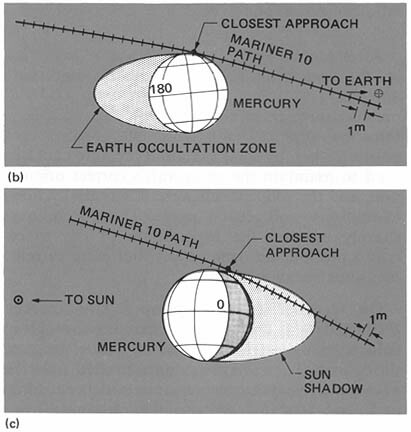 With its new orbit velocity, Mariner was expected to pass 16,000 km (10,000 mi) farther away from Mercury, or about 50,000 km (31,000 mi) at about 40 deg south latitude ( see Fig. 8-4). There were two reasons why this fifth correction maneuver was commanded. 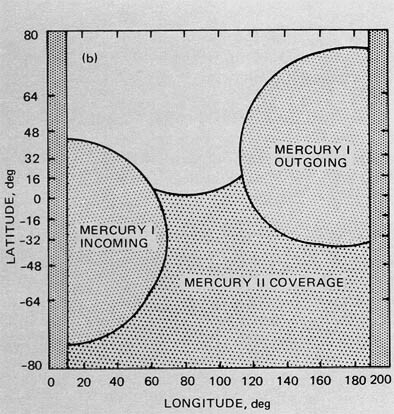 First, a more favorable passage was desired at the second Mercury encounter (which became known as Mercury II) in terms of science data return. The second. 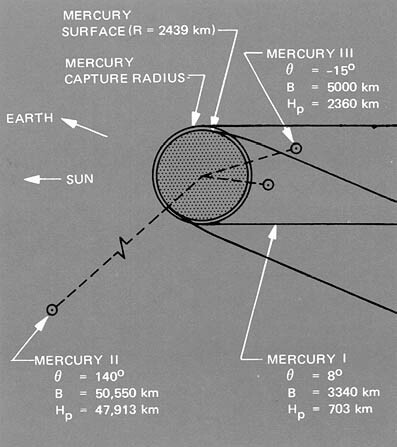 objective was to allow retargeting of the resultant trajectory between Mercury II and a possible Mercury III to a variety of realizable aiming points at Mercury III which would not exceed Mariner 10's remaining trajectory correction capability. Fig. 8-4. 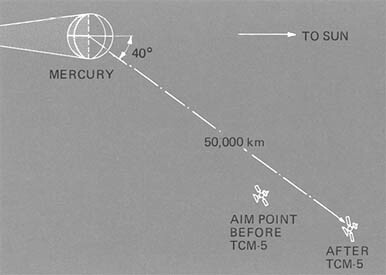 As a result of the trajectory correction, aim points for the second encounter, termed Mercury II, brought the spacecraft farther out on the sunlit side to gain improved TV coverage. Point of closest approach during the second encounter occurred at 1:59 p.m. PDT on September 21, 1974, and some 500 pictures of Mercury were returned during the three-day encounter sequence. This second encounter provided a substantial increase in area of the planet covered by detailed mosaics (Fig. 8-5), in extending the coverage from 50 to 75% of the illuminated hemisphere, and it showed details in the south polar region ( Fig. 8-6 ). No totally new terrain types were found, increasing scientists' confidence that Mercury I conclusions were based on a representative sample of the Hermian surface. Scarps similar to those noted at the first encounter were found in southern latitudes, thereby verifying the global character of the forces which formed them. Fig. 8-5. The new pictures were fantastic. A southern hemisphere area of heavily cratered terrain (460 by 650 km, 285 by 400 mi) on which a prominent scarp extends several hundreds of kilometers at the upper left is shown in (a). The smallest details measure about 1.7 km (1 mi). Another densely cratered region containing a scarp which rises about two km (7500 ft) above the surrounding area is shown in (b). The scarp shown in (c) is more than 300 km (185 mi) long. These structures are explained as compressive faults caused when the core of Mercury shrank after most of the craters had been formed on the surface. Mercury II was an epic encounter, the first time any spacecraft had returned to its target planet for a second look. The second encounter was made when the spacecraft was much more distant from Earth than at the first encounter, and in order to get the full complement of TV images back to make a complete mosaic of the planet, engineers at the Goldstone station had to develop an unusual antenna configuration. They connected the three big Goldstone antennas together-one 64-m and two 26-m antennas-with microwave links and operated them as one large antenna. The error rate for this distant encounter was thereby reduced to about 3 bits per hundred, and pictures of superb quality were obtained in real-time. These pictures provided mosaics over large areas of the planet's surface, with coverage of some areas from several different viewing angles. Many of these mosaics are reproduced in an appendix. The additional coverage of the planet by the second encounter is shown on the U.S. Geological Survey map reproduced in Fig. 8-7 and one of the mosaics in Fig. 8-8. The second flyby was mainly devoted to imaging science, since the spacecraft was too far from the planet to obtain significant data with some of the other science experiments. However, the ultraviolet experiment was able to make good use of the distant sunlit-side encounter. The slit of the spectrograph was commanded through many slow drift scans across the surface of the planet. Thus, good ultraviolet data were obtained to set even more accurate upper limits of the density of the helium atmosphere of Mercury than those set at the first encounter, i.e., less than 10-15 the density of Earth's atmosphere. Also during this encounter, the emission lines of helium were seen again. Fig. 8-6. 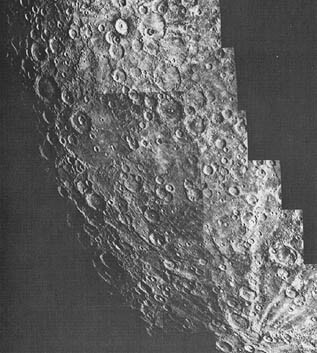 On this second flyby, Mariner 10 was able to obtain close-ups of the south pole of Mercury, showing that no different land forms exist in the polar region. Also, the photographs show that the compressional scarps extend into the polar regions. The pole is located inside the large crater, 180 km (110 mi) in diameter, on Mercury's limb (lower center). Just above and to the right of the south pole is a double ring basin about 200 km (125 mi) in diameter. A bright ray system, splashed from a 50-km (30-mi) crater, appears at the upper right. The picture was taken at a distance of 85,800 km (53,200 mi), within two hours of Mariner's approaching closest to Mercury. Fig. 8-7. The additional coverage of Mercury by the second encounter is shown by the hatched portion over this USGS map made on the basis of the first encounter. In this second encounter a navigational technique was tested that would be essential for subsequent missions to the outer planets. All interplanetary flights to date relied solely on Earth-based radio measurements for navigation. Project scientists decided to conduct experiments with Mariner 10 to find out if optical navigation is practical. From September 17 through 19, some one hundred pictures were taken by the TV imaging system to obtain angular measurements between Mercury and stars. First results showed that the experiment was successful, demonstrating that long missions to outer planets will be able to use this technique to navigate spacecraft through the intertwining orbits of satellites of the big planets, Jupiter and Saturn. Fig. 8-8. The new mosaics produced from the pictures returned from Mercury II were equally as good as the two from the first encounter. Mercury II mosaics gave many different panoramas of the same area seen at various viewing angles. These mosaics are reproduced in Appendix A. The one shown here covers the heavily cratered south polar region as seen from a distance of about 65,000 km (40,000 mi). The south pole is just off the field of view at the bottom, and north is at the top. Numerous scarps are revealed, some of which are several hundred kilometers long and transect and distort large craters. Ray systems associated with two fresh craters are prominent at the top and bottom of the picture. Small areas of relatively smooth, flat terrain are visible near the center of the field of view and appear to fill a large, badly degraded, circular basin 350 km (220 mi) in diameter near the terminator. After Mercury II, Mariner 10 was placed back in the cruise mode in which the high-gain antenna and solar panels were used as lightpressure torquers to save attitude control gas for a third encounter. The antenna was placed in a position whereby solar radiation pressure could be used to maintain the spacecraft's correct orientation, and the solar panels were differentially tilted to minimize roll jet gas usage. These techniques sharply reduced the expenditure of the spacecraft's precious nitrogen supply, but more extreme measures became necessary. On October 6, the Canopus star tracker, distracted by a bright particle passing through its field of view, lost lock on the reference star, and the spacecraft went into an uncontrolled roll. The automatic reacquisition sequence had been inhibited, and repeated reacquisition attempts using commands timed on the basis of the star tracker roll error signal telemetry were unsuccessful. Each of these attempts required the momentary turn-on of the gyros, and the resultant oscillation events depleted the gas supply below that required to achieve Mercury III ( 160 days of cruise remained). Roll axis stabilization had therefore to be abandoned, and a "roll drift" mode adopted, whereby the spacecraft was allowed to roll slowly, the rate being controlled by differentially tilting the solar panels. The roll rates had to be maintained quite low to prevent excessive use of the pitch and yaw jets, and also to allow gyro turn-on for trajectory correction maneuvers and pre-encounter reacquisition without inducing an oscillation. The method was made more difficult by the loss of engineering telemetry channels mentioned earlier. The Canopus intensity channel, from which a "star map" capable of defining roll position quite accurately could be calculated, had been lost. The "roll error" signal from the tracker remained, but this gave only an approximate position of those stars bright enough to be acquirable by the tracker. Since at no time during the Mercury II-III transit were there more than three such stars, roll position knowledge was difficult to obtain with any precision. One technique to obtain this information which proved very useful was measurement of the intensity of the signal from the low-gain antenna, which varied with roll position because of the nonuniformity in the antenna's radiation pattern (measured before launch) and its noncentral position on the spacecraft. This measurement was, in fact, the sole indication of roll position and rate upon which the critical command to stop the spacecraft for reacquisition was sent just hours before the third encounter. But " roll drift " worked, reducing gas consumption to some 25% of normal cruise usage, allowing Mariner to reach Mercury III with a slim margin (the gas supply was exhausted just a few days following encounter). The continuous rolling of the spacecraft complicated the navigation task, in that it introduced a modulation on the doppler measurements because of the off-center position of the low-gain antenna. This complication required special modifications to the complex orbit determination computer programs. The problem was further aggravated by sharply reduced station coverage ( Mariner could be tracked less than 20% of the time because of the needs of the Pioneer and Helios programs). Nevertheless, three trajectory correction maneuvers were successfully completed during this period, putting the spacecraft on a trajectory which produced the closest planetary flyby yet accomplished (Fig. 8-9). A few days before the encounter, trouble again hit the spacecraft and added considerable drama to the final stages of this extended mission. During the attempt to reacquire the reference star Canopus, the spacecraft rolled into a null position on the low-gain antenna, and communications with Earth were broken. To compound the problem, the spacecraft could not be commanded by the smaller DSN antennas, and there were demands on the bigger antennas to communicate with other spacecraft: Pioneer 11, on its way to Saturn, and Helios, approaching its perihelion passage. To save Mariner, the German controllers of Helios were asked to surrender some of their scheduled receiving time on the big antennas. Even though this was the period of maximum scientific interest during the Helios mission, they acceded to the Mariner project's request. 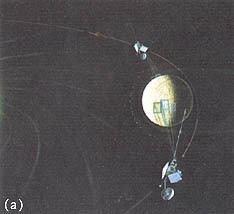 As a direct result, commands reached Mariner from the big antenna at Madrid, and the spacecraft broke from its null mode and achieved its correct orientation for the third flyby of the innermost planet. It had been a close call-reacquisition had been achieved just a few hours before closest approach. Fig. 8-9. 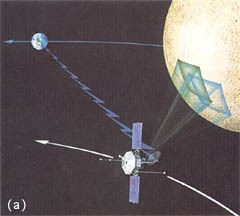 The third encounter is graphically shown in this artist's concept (a), while (b) and (c) show the flight path as seen from the Earth and from the Sun. ....the incoming and outgoing paths provided opportunities for imaging science as they did at the first encounter. 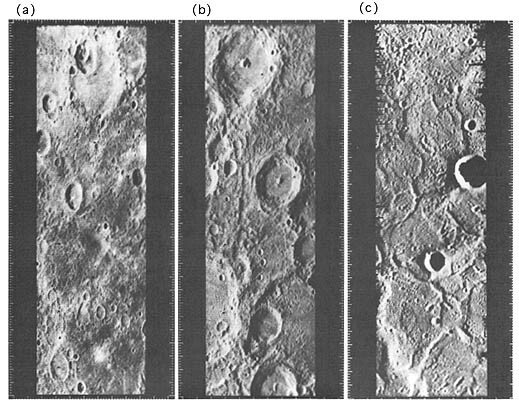 The cameras were directed to produce high-resolution mosaics of areas of interest discovered at Mercury I. The third encounter produced some remarkably detailed pictures of small areas of the Hermian surface on which objects as small as 137 m (450 ft) can be identified. Figure 8-10 provides a selection of these pictures. Fig. 8-10. 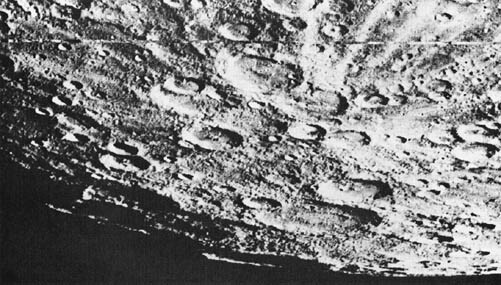 High-resolution pictures, each only a quarter frame, were obtained at the third encounter, Mercury lilt In the upper portion of (a), which was taken from a distance of 67,000 km (41,500 mi) on March 16, 1975, a multiple impact feature of three craters of different sizes nested within the largest is shown. The smallest crater is about 15 km (9 mi) in diameter. The bright feature at the bottom was caused by impact of a meteorite; it is a fresh crater. Craters ranging in size from 30 to 50 km (18.5 to 31 mi) are shown in (b). It was taken at a distance of 65,000 km (40,000 mi), one hour and 45 min before closest approach. The fractured and ridged plains of the floor of the Caloris basin are shown in (c). The area is located at 31°N latitude and 183°W longitude. The picture was taken at a range of 19,000 km (11,800 mi), 34 min after the spacecraft swept past Mercury for the third and final encounter. ....version of the Earth's field. The actual times of passage through the bow shock, the magnetopause, and the maximum field were almost exactly as predicted (see table). *Amplitude predicted was 200 to 500 gamma; actual was 400 gamma. 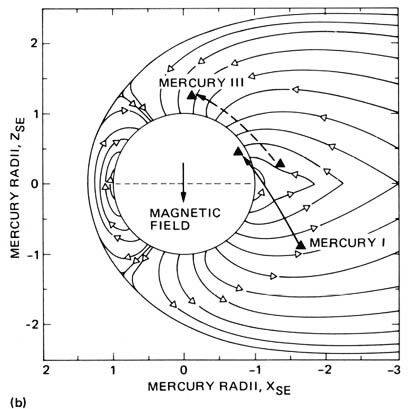 In addition, observations of the low-energy solar wind electrons revealed that the magnetosphere of Mercury fits very closely to a scaled-down Earth's magnetosphere (Fig. 8-11), thereby reinforcing the results of the magnetometer experiment. Finally, the observations of relativistic particles confirmed that Mercury, like the Earth, has a magnetically neutral "tail," with a dividing neutral sheet. From this region, explosively accelerated bursts of electrons and protons are ejected. These brief, high-intensity bursts, first detected on Mercury I, are believed to originate from cancellation of magnetic fields. Fig. 8-11. Mariner 10's path through the third encounter passed over the planet. Looking down from the north, (a) shows the interaction of the solar wind with the magnetic field of the planet. 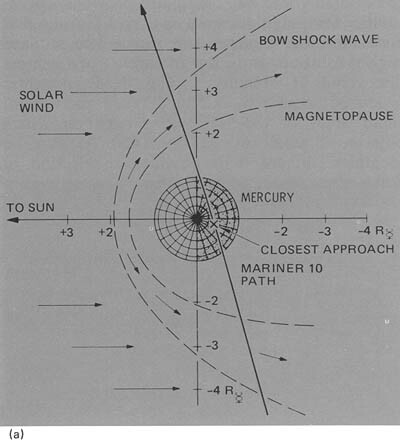 The crossings of the bow shock wave and the magnetopause corresponded with the times predicted from the measurements made during the first encounter, thereby confirming that the magnetic field of Mercury is intrinsic to the planet. An equatorial plane view of the planet's magnetic field lines is given in (b), which shows portions of the path of Mariner 10 through the field at the first and third encounters. ....despite the many obstacles, continued its lonely orbiting of the Sun. A few days later, the U.S. Postal Service issued a commemorative stamp (Fig. 8-12) honoring the project in ceremonies at the Jet Propulsion Laboratory. Mariner 10's observations of the two inner planets, with three observations in one mission of the innermost, added another to the long series of NASA firsts in the golden age of planetary exploration. In March 1940 the planets Mars, Saturn, Venus, Jupiter and Mercury were all lined up in that order in the evening sky, a brilliant celestial necklace of other worlds. There were few people at that time in science or engineering who would have thought that mankind would explore all these planets with spacecraft within 40 years. Yet now that Mariner 10 has visited Mercury, Pioneer 10 has visited Jupiter, and Pioneer 11 has safely passed Jupiter and is on its way to Saturn for a flyby in 1979, this tremendous feat of interplanetary exploration has been accomplished, and man has become more aware of the Solar System and the place in it of the Earth. Fig. 8-12. 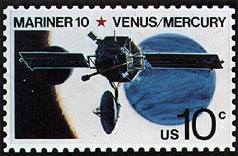 Commemorative stamp issued by the postal service honoring the achievements of Mariner 10.